If you’ve been following this blog, you know that my two children attend our local Japanese elementary school. Lulu, 10, is now in fourth grade, and Roy, 7, is in second grade. Because of their schooling, they receive substantially less exposure in English than they do in Japanese. In previous posts—Do Your Bilingual Children Go to School in the Majority Language? and Help! My Bilingual Children Are Losing Their Ability in the Minority Language!, I discuss the potential “danger” of this “second stage” of the bilingual journey, when the child begins formal schooling and this spike in exposure to the majority language shifts the balance of power: the majority language grows dominant at the expense of the minority language, which may turn more passive. In fact, because of this possibility, in these articles I stress the importance of visiting the school and seeing what the child is experiencing with your own eyes in order to grasp the hard reality of this intensive exposure to the majority language, day after day. By recognizing clearly what you’re up against, you can better match your motivation to the size of the challenge, enabling you to be more effective in supporting the child’s minority side. Well, we’ve just begun the summer break in Japan, but there was another “parents’ day” not long ago and I went to school to observe my children once again. Let me back up for a moment and tell you that last year my wife and I were disappointed in the teacher that Lulu had for third grade. Actually, she had two teachers. The first one was wonderful—but she left on maternity leave midway through the school year. And her replacement—a young man fresh out of college—was pretty awful, I’m afraid, even making allowances for his lack of experience. But happily, when the new school year began this past April (in Japan, the school year runs from April to March), we learned that Lulu had someone different: a woman with years of experience and a reputation for being a really fine teacher. But, why, as I stood there to the side of her classroom at the recent “parents’ day,” watching her teach Japanese proverbs with such authority and skill, did I feel some strange and unexpected misgivings? Wasn’t she exactly the sort of teacher I had hoped would be assigned to Lulu’s fourth grade class? How could I feel anything less than thrilled? As I wrestled with this confusion, the teacher asked the students to take out their dictionaries. Lulu set a large white dictionary on her desk—though we bought it two years ago, it still looked practically brand new. Then the girl seated next to her produced a dictionary that was so swollen with post-it notes—a thick forest of little pink, yellow, and blue slips of paper—that it was literally impossible to see the pages from the side. My eyes boggled. I looked around the room and saw that many of Lulu’s classmates had also stuffed their dictionaries with post-it notes. And, naturally, I couldn’t help thinking, with some concern: Why does my daughter’s dictionary have no post-it notes at all? I then thought of my wife: a good mother, and helpful with the children’s homework, but never a diligent student herself during her school days, and never a teacher. Was this holding them back academically? Should I be stepping in to help more with their Japanese studies? I looked back at Lulu, leafing through her Japanese dictionary. And suddenly it struck me, everything now making odd, ironic sense: The truth is, I don’t want them to do well in school. Okay, that’s not entirely true. I do want them to do well, just not too well. (For the record, they’re both doing fine.) At least at this stage of the process, when I feel it’s still important to emphasize their development in English, I’m afraid that any greater stress on Japanese would undermine this aim. In other words, for the sake of their larger bilingual development, I think a more positive outcome is possible by momentarily keeping the majority language from advancing too strongly. For the time being, then, I’m actually quite content with Lulu’s post-it-free dictionary. Once they get a bit older, and their English is even stronger, perhaps I’ll push their Japanese studies more. At that point, with stable, high-level ability in both languages, I suspect their Japanese can then help stretch, rather than suppress, their English. P.S. For more on the “second stage” of the bilingual journey, when a child begins schooling in the majority language, see Watch Out for the Tough “Second Stage” of Bilingual Development. How about you? Do your kids attend a majority language school, too? Any thoughts in reaction to this post? Your suggestions are really inspiring. Being a language teacher I love reading your posts. Thank you, Anila! I’m glad you’re enjoying my posts! Thanks for sharing this so sincerely! I’ve been thinking about school years in the majority language that are still to come and realize I’m going to face a challenge: I’m very likely to be the one to help our son with his majority language homework (at least some part of it). I’m worried how it might affect our son’s need to use the minority language with me. By that time I hope to come up with good ideas! Thanks to your blog as well! Elena, probably the main thing for preventing future difficulties would be the efforts you’re making now: if you can “condition” him to use the minority language with you, and establish this pattern firmly, then adding a distinct “homework domain” at a later age—which is the only time you’ll really use the majority language with him—shouldn’t be all that problematic. At the same time, this homework time could actually be used to your advantage if you continue to speak the minority language as much as you can. In fact, when I help my own kids with their Japanese homework, I only use English. This “forces” them to interpret between the two languages, which stretches their bilingual ability, and to engage with the material in both Japanese and English, which deepens the learning, I believe. It may take a bit longer this way, but the benefits (including the fact that you can limit your use of the majority language) are well worth it. I remember my mom helping us with homework. She’d use German even when it was English homework. Boy, did we get MAD sometimes. I imagine it to be even harder with Japanese because at least German and English have the same alphabet. I sure do admire you. Now unless kidlet is around we actually speak both (my mom and I that is). There are some things that can just only be conveyed in one particular language. Untranslatable phases so to speak. I can switch in between the languages without effort. I don’t even think about it, so I have to watch it with my son sometimes. You know, I always thought that English language education in Japan was better than it is in Germany but boy was I wrong. If the German high school students that have had homestays with us are fair examples, English language education in Germany is far more effective than in Japan, where English lessons basically don’t begin until junior high school, and even then, are largely focused on passive activities, like grammar and reading. So I suspect that, as a whole, young people in Germany (like young people in the Czech Republic, where I taught for two years) are much more capable in English than young people in Japan. As much as I’d agree there is something else in life than schooling when you’re a kid, and therefore, as long as they’re doing ok I wouldn’t push my children too much, I don’t know if I agree with your reasons with regards to bilingualism. I had a fairly relatively good academic education in France, loved reading, etc… and I find that it helped me when I decided to come to England to become fluent in English. I started fairly quickly to read complex books, getting by in various situation, feeling fairly confident writing professional documentation and correcting other peoples’ ones. I suppose because of that, my gut feeling was that as long as my daughters had good bases and were happy to speak to me in French, they would eventually catch up with their French peers as the need arise. Basically, if I could do it quite well, they should be able to do it much better! Armelle, I don’t really disagree with you. 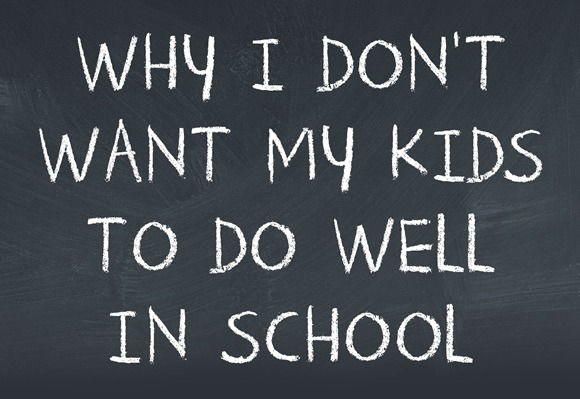 In fact, as I mentioned, when my kids are older (once they begin junior high school, let’s say), I’ll likely “push” their academic performance more. So, from my personal perspective, it’s really just a question of timing. To maximize their larger, long-term bilingual development, I sense that it would likely be better to avoid allowing their majority language to grow at a stronger pace at this particular stage. This reasoning, I should add, involves other variables like the fact that Japan is so far from the United States (where I’m from), and we don’t often have the opportunity to make this trip. If such travel was more available to us—which means they’d be getting regular “booster shots” of English—it’s possible I would feel a little differently, a little less cautious, when it comes to their schooling in Japanese. Armelle, I hope you and your girls have a fun and fruitful time in France! I am wondering though, if and how much of Japanese reading practice your kids did at home when they were learning to read? Did they learn to read in both languages simultaneously or in one first and then the other? For a child who is a weak reader in both languages, would you recommend focusing on just one until that’s up to speed, or continuing to slowly progress in both? Would love to hear your thoughts, thanks so much for your informative posts! Laura, I’m glad this post spoke to you. In our case, because the English and Japanese scripts are so different—and Japanese literacy is very time-consuming for a child to acquire—I felt it was important to give their English literacy a strong head start. So, before they began learning to read and write in Japanese at school, I actively nurtured their reading and writing in English at home. In your case, because English and German are more similar, this is largely to your advantage, I think. Though, early on, this may cause some confusion (and might be one reason for your teacher’s recommendation), there is also helpful “transfer” in reading ability from one language to the other. That is, I would expect that as your son’s reading ability grows in one language (while learning to better distinguish between the two scripts), it will also grow in the other. It’s true, this “transfer” could be of benefit in the same way if he first focused on reading only English, and then picked up German again—his stronger competence in English would then serve as a springboard for reading in German. But the “danger” in this approach is that he will become accustomed to reading only (or mostly) in English and might not be as inclined to read in German after that. Though it’s difficult for me to offer advice from this distance, not knowing the full details of your situation, I think it would probably be best to stick with German, too, and support the simultaneous development of literacy in both languages. At the same time, you might strengthen your efforts by browsing the many posts I’ve made on reading, including the articles on captive reading. Laura, I wish you and your son all the best! Stay persistent, and playful, and I expect you’ll see gradual growth of his reading ability, in both languages, over time. Thank you so much, Adam, that is great advice! And I’ve already started my first captive reading story, just haven’t printed it out yet. Love that idea though, as well as the many others on your site. I’m so happy I discovered it, thanks for all those ideas! Laura, captive reading has been one of my “secret weapons” and I believe it’s had a hugely positive impact on my children’s reading ability in the minority language. Do this persistently and it will pay off for you and your son, too. Yes, I especially recommend the tactic I describe in Turn Your Kids into Eager Readers with This Fun, Simple Strategy, and the follow-up post My Favorite Way to Get a Bilingual Child Reading More in the Minority Language. This lively strategy is guaranteed to get your son reading more! Have fun! This one really resonates with me. We all had our dad’s Southern accent when we returned to Germany because that was where we lived then and it was not uncommon for English teachers to mark us down for the way we pronounced certain things. It wasn’t so much the teachers being mean, they just never heard that particular accent before – and it was quite strong in those days too. I know my first English teacher here thought that I was doing it on purpose. I once pronounced wash “warsh” when reading out loud and that apparently was the very last straw and she threw me straight out of the classroom for the entire duration of class. Her assumption was that because I already knew all the material I wanted to make a game out of it. That was the last class of the day and dad picked me up that day. When she heard him speaking to me in the same accent, she just about fell over. I don’t know why I just shared this story but for the first time in a long time that came to mind and I’m chuckling at it. I ended up with a B instead of an A in English class the year of the “warsh” incident because she constantly marked me down for pronouncing things the way I did. Interestingly, I’m the only one who retained the accent and I was neither the youngest nor the oldest. I also retained my mother’s and grandmother’s local dialect in my German and my sisters did not though my younger sister’s high German is incredibly fake and affected if I may say so (the older one no longer speaks German). I however was more of a homebody than either of them. I read more and spent more time talking with my parents, particularly in my teens. I tended to gravitate more toward Swabian (local dialect) and Southern accented people’s company. Maybe I was conditioned to not like the sound of high German and non Southern US accents as much but somehow that mustn’t have happened with my sisters since neither of them seems to feel that way. Or maybe my brain just doesn’t want either to fade because when relatives say that I sound like either parent when speaking their language, it makes me so proud and I never do want to sound different than that. So one day my own grandkids will know what great grandma and grandpa sounded like without having the pleasure of meeting them. Now my sister who lives here in Germany does not want to speak English to her kids so they learn it “right”, aren’t bored at school and don’t run the risk of being marked down for potentially pronouncing something in a way unfamiliar to a teacher trained in British English. I hated being bored in English class as much as she did, but that isn’t reason enough not to raise him bilingually in my opinion. English class is half an hour a day, he’ll live. Besides that I’m not teaching him to read or write in English so he can still have a challenge there. And really, some teachers had even made accommodations where I was allowed to draw or read during English class and only had to complete the work and sit the tests. My sister places school, liking school, fitting in at school etc. above pretty much anything. School is important but I’m glad that my parents did NOT always listen to teachers. One in Kindergarten in the states insisted that my mom drop German because I was not learning to read. Then my sister had this wackjob from the North who was convinced children with Southern accents could not learn to spell or sound out words (then someone in Germany had the same attitude regarding kids who did not speak High German). Then when we got back to Germany the advice was to drop English completely so our German would grow. We all learned to speak, read, spell and graduated from German schools with more than passing grades. I’m glad my parents did it first because otherwise I might have been way more alarmed when the pediatrician was so concerned about his German at the 2 year check up and wanted to put him in early intervention for having “not enough words”. I told him he has so many more English words which he did not agree with because “he will have to live in Germany. You NEED to speak German to him”. But how could he possibly not learn German even if I never utter a word of it around him? The only way he couldn’t would be if I locked him up in my house containing only English music, books and movies and never send him to school for the duration of his childhood. His German is catching up SO MUCH now that he is starting to be interested in playing with German kids and realizing that they don’t know any English. Okay, now enough of those posts. I’m way too long winded. But going from the post you recommended I ended up seeing so many others and somehow that and your response to my first post made me think back to my own childhood and experiences with growing up bilingual. I would also like to ask you, how can I teach my son the local dialect? I know he will learn the regular German at school but I at the very least want him to understand the dialect, even if he will not speak it, though my focus is now on English. My grandma speaks it and I have her speak with him a lot. She loves when he comes to visit. My mom speaks it as well but since she speaks English fluently, I do speak English to her around him and he speaks to her in English as well. I’m not sure if I should have her speak to him in her German dialect. Since it is basically German, would my grandma be enough? Michelle, thank you for sharing your background as a bilingual child. It was really interesting to hear. As for your question about dialect, it’s hard for me to judge whether exposure to his grandmother alone would be “enough” or not. So if his development in English is progressing well, then perhaps your mother could use this dialect more, too, to increase his exposure to it. The greater the amount of exposure, in any language or dialect, the greater the odds of stronger acquisition. I think I will be your constant visitor of your informative blog. Yorushiku onegaishimasu. It’s almost spring break and we haven’t finalized our decision whether we transfer our daughter to a local Japanese elementary school or continue in her current school (International school). Our daughter will be in 2nd grade in April. I want to transfer her to local school for various reasons. Since our daughter is half Japanese, maybe it’s better if she experiences the normal Japanese school life and make more friends in the neighborhood. She’s been attending the same school since preschool. I can say, she already acquired English as her first language so even if she transfers to a Japanese school, it won’t be a problem. I am planning to homeschool her at the same time and send her to English literacy after school. Japanese school also means long summer break. It will be easier for us to have a vacation in my country and maybe travel to other places. We haven’t done that for a long time since her current school’s breaks only last for 2 weeks and we cannot afford to travel because we spend more on her school. Those are my plans for this school year but the problem is, my husband is a bit hesitant to transfer her to a local school. He’s worried our daughter will be more comfortable in speaking the majority language and also the transitions that she may go through because it will be totally different, the language, environment, lessons, etc. When I think about his worries, it’s hard to make a decision. I need to read more of your blog but if you have advice for me, thank you in advance. Meirin, yes, these can be difficult decisions. As I’m not familiar with the full details of the situation, I can’t really offer specific advice, but it sounds like switching to a local school may offer some important advantages, as long as you can maintain strong support for her English side. As I discuss in Do Your Bilingual Children Go to School in the Majority Language? and several more posts about schooling (you’ll find those links below that first post on the subject), it’s important not to underestimate the impact of this intensive majority language exposure on the child’s bilingual development. In our case, we chose not to send our children to the international school in Hiroshima (for the reasons I describe in Should I Send My Child to an International School? ), but it’s true that this decision has meant I have had to work very hard, day after day, to maintain their exposure and progress in English as they attend a Japanese school. Because your daughter is still small, this would be a good time to try the local elementary school and give it a fair chance for a year. If it doesn’t work out, you could return to the international school, right? Next post: Have You Failed at Raising a Bilingual Child?